This picture mat is perfect! I can't thank you enough for capturing how pretty they were for our big day! I have already been recommending you to others and will most certainly continue! What you do is definitely a unique and special way to keep something awesome from our wedding! I appreciate every piece you did, especially including pieces from my mom's veil. And again, thank you for including the little vases with the extra pieces. They're already in place as a perfect little house decor. You are wonderful! Thanks again! The mat is beautiful. My sister will be ecstatic. She will cry, I guarantee. I also love the ornament. I love Christmas ornaments. Every year I purchase an ornament for each of my 3 kids representing what is going on in their life at that time. But this one is for me. This year it was Grandma related (my mom who just passed). I got each of them 2 ornaments this year. One gingerbread house because my mom used to make ginger bread houses with them when they were little. The second one was the game of Sorry. We always played cards and games with my mom and we played numerous games of Sorry over the years. So, you helped make a memory that will last a life time. Petal a Memory has developed a unique and creative way of preserving a beautiful moment in time. Not only does it create a lasting memorial of your event, but it's a great conversation piece. Whether you are celebrating a wedding or a baby, being able to preserve your memories with framing your flowers will always make you smile as you look at them. In our experience, we had beautiful arrangements and assumed we would end up throwing them away at some point. But with Petal a Memory, your able to have those flowers forever. When my father died 2 years ago, the funeral home created a beautiful portrait of him. Since he had 4 kids and a wife, it was hard to say who could keep the picture. I got the idea to have prints made of it for everyone. I called Michele who I knew from a craft show, and she created gorgeous mats using the flowers from his funeral. 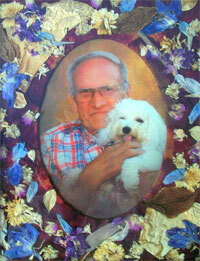 I gave the matted pictures as Christmas gifts, and everyone was touched, and loved them. So much so, that my brother, who had kept the large portrait, was disappointed and wanted the flower matted print! Michele was easy to work with, sensitive to our feelings of loss, and truly wanted to create something special. 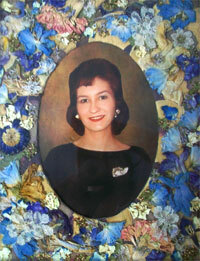 When my mother died a year and a half later, it was assumed by the family that we would get the matted prints. I mentioned to Michele that we found my mother's wedding dress, and it was in very poor shape and could not be restored. She was able to use the lace from the dress in the mats, and used all my mother's favorite colors, making a meaningful and beautiful memento. I look forward to more (happy) occasions where I can use Petal-A-Memory, and have already referred several very satisfied friends. One red rose bud from our daughter’s wedding bouquet stood in a small vase for 13 years until Michele transformed it onto a frame for our granddaughter’s first communion picture. Michele from Petal A Memory recreates the moment from a special occasion with her talented ideas. I purchased a 11x17 matted frame which consisted of the invitation from the wedding, flowers that the Bride carried which was freeze dried by Michele and a space for the couple to put a 5x7 photo of themselves. The Bride has this frame displayed in her foyer and everyone has commented on such a wonderful gift and idea. I would suggest gifts such as this for the special moments in your people’s lives. I was so pleased to find Petal A Memory so that I had a way to capture the beauty of my wedding bouquet. Michele did a great job displaying each of the different flowers that I chose to carry so that I could see them on the matting and treasure that keepsake for many years. 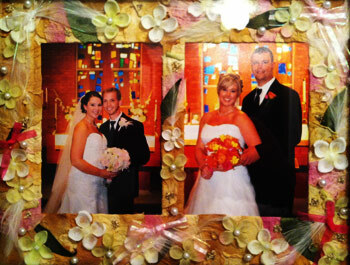 I chose a wedding photo that had my bouquet in it and used it in one of the many mattings Michele created for me. Job well done! As a mature bride, I wasn't sure what I wanted to do with my wedding bouquet but Michele at Petal A Memory was able to help me create a beautiful matting to put in my home. She incorporated not only the flowers from mine and my daughters bouquets, but also lace and beads from my gown. The matting turned out gorgeous and I am so pleased that I decided to showcase my flowers with Michele. As a professional in the funeral industry, I am always looking for new and innovative ways to capture value in the funeral process. Michele at Petal a Memory has certainly done that with her thoughtful and timeless creation of the photo mattings and bookmarks. Families can now enjoy the sweet memories of their loved ones photographs embraced with the symbolic gesture of kindness in the way of flowers sent by family and friends. I think that using the sympathy flowers sprays to make photo mattings is a great way to commemorate the outreach of care that goes along with difficult times. Michele makes herself available to the families so that they can express what they want done with the flowers and ultimately have a treasured keepsake to be pleasantly reminded of their loved one. I stumbled across Petal a Memory at a Bridal Show in Monroeville last year while planning for my October 8th, 2011 wedding. I had already known that my grandmother was going to be purchasing my bouquet as part of my wedding gift and I was thinking of ways to preserve it. PERFECT! Thanks to Petal a Memory I have a beautiful matte that I have chosen to display a picture of my Husband and I where I am holding onto that bouquet. I highly recommend Petal a Memory! When you are spending a lot of money for your fresh flowers for the day of your wedding why not make a keepsake out of them! This is a FANTASTIC option for every occasion that includes flowers!! We met at a show before my wedding last July. I was so intrigued by the artistic talent. My fiancé suggested that we bring my wedding bouquet to her as well as the bridesmaid's. What a GREAT decision!!!! She was so wonderfully easy to work with--totally honest---and created masterpieces for myself and my girls. She helped me locate the perfect frames to enhance her work!! When we came back to get them---we were amazed!!! She hadn't been sure if some of the tropical flowers would retain their shape and color----but they TOTALLY HAD!! but the surprises didn't end there!!! As a special touch---I was given a vase with the extra petals covered with tulle and sealed with ribbons exactly matching the colors of our wedding!! My daughters (our bridesmaids) took each of their frames when the moved to college dorms in September. (amazing---teen girls showing off a gift from their parents!) Definitely worth every penny we spent (and the cost was amazingly low!) If you are even thinking about doing it---DO IT!! Thank you SO much, Michele---you have a fan for life!! There are three easy steps to placing an order with Petal a Memory. Follow the steps on our ordering checklist. Mail or drop off your flowers to our business location. You will receive a consultation phone call from Petal a Memory to review your order and verify the details. Most orders take about four to six weeks for completion. The cost of our mats ranges between $25.00 and $55.00. This is a small price to pay to have a satisfied client for whom you have exceeded all expectations. This gesture will be highly regarded and will not go unnoticed. Don’t miss the opportunity to help ease the pain for someone in the process of grieving. To learn more, contact Petal a Memory today!